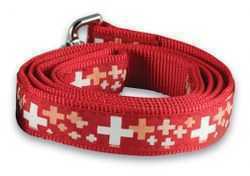 Red or Black Leather Dog Collars – with attached brass Appenzell accents. See HOW TO CHOOSE SIZE below. 1" or 1 and 3/8" wide. Constructed of woven nylon fiber, accented with a pattern of Swiss crosses. Collars have hi-impact plastic buckles. Size: 1" wide, adjusts 16 - 22"